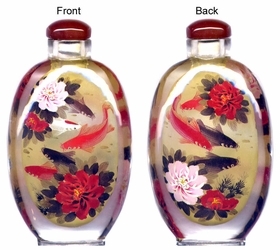 This Chinese snuff bottle is painted with fish and peony on both sides. In the Chinese culture, the fish symbolizes prosperity and wealth. Peony symbolizes happiness and prosperity. 100% Hand painted Chinese snuff bottle.